Brigham Young University: B.S. in Political Science (1956). University of Minnesota: MS in Public Administration (1958). University of Southern California: MPA (1968); Doctorate Public Adm. (1972). Professor & Assistant Vice President, Brigham Young University; serving as Director the Institute (George Romney) of Public Management, Marriott School of Management (1969-1978), & Assistant Executive Vice President for Development (1986-1991). Visiting Professor of Public Administration (1972-1985), University of Southern California. Research Member Maxwell Committee on Restructuring the Legislative Process (1964-1965). Member Utah State Senate (1972 -1985); Chairman Rules, State & Local Government Affairs Committees, and Senate Majority Leader. Utah State Constitutional Revision Commission; Member & Chairman (1975-1987). Sponsor of major constitutional measures revising articles of the Utah’s Constitution. 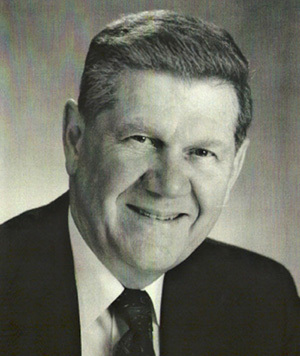 Utah State House Fellowship Commission; Member and Chairman (1977-1981). Utah Technology Finance Corporation; Trustee (1986-1995), Chairman of the Board (1989-1995), a non profit corporation chartered by the State of Utah to promote moving high- tech innovations to the market place. Local Government Activities; Co-chair of ad hoc group to restructure Provo City municipal government; author and sponsor of legislation authorizing the restructure of local government in cities of the First and Second Class. Republican Party: Long time party worker serving as Voting District Chairman, Central Utah Congressional Campaign Chairman for Congressmen Sherman P. Lloyd; Committee to elect Congressman Howard C. Nielson & Christopher Cannon. Chairman Utah State Republican Convention, 1976. Delegate to State Republican Conventions (1960-1992). USAID / NY Institute of Public Administration : On-site Team Research Director for analyzing the man-power needs of the Republic of South Vietnam, and the role of the Saigon National Institute of Administration, Saigon, South Vietnam (1969-70). review Israel’s hopes for peace and well as its plans for maintaining its military strength; over a period of one month the team was given total access to all areas of the country, meeting with key cabinet ministers, and attending debates of the Knesset. Republic of South Africa. One of eight American State Legislators invited to review the Government of South Africa’s proposed revision of its Constitution; meeting with government officials, labor and opposition leaders, attending parliamentary debates, and visiting with local businessmen throughout the whole of South Africa over a four week period, August, 1980. Warren Burger Task Force on Prison Industries; One of ten Task Force members studying prison industries in Denmark and Sweden with the objective of identifying areas for adaptation to United State prisons (1983-1986). USAID / Institute of Public Administration Contractor: On-site Team Research Director for analyzing the man-power needs of the Republic of South Vietnam, and the role of the Saigon National Institute of Administration, Saigon, South Vietnam (1969-70). “Outstanding Elected Official in Utah, 1981”, Utah State Employees Association. “Excellence in the Advancement of Public Personnel”, 1981, presented by the Governor of the State of Utah and the U.S. Office of Personnel Management. “One of Ten Outstanding Legislators in America, 1984”, National Federation of Federal Employees, Washington, D. C.
Special Representatives for The Church of Jesus Christ of Latter-day Saint to United Nations Ambassadors and Consuls General in Greater NYC, August 1997 through March 2000. Other Service with wife Donna; 2002 Salt Lake Winter Olympics, Southeast Area Humanitarian Directors (2003-2005), LDS Charities Measles Immunization to the Kingdom of Swaziland (2006, and the Kingdom of Lesotho (2007).